Yesterday marked one month since I was diagnosed with Bell's Palsy, and it has been such a life changing experience. There have been some pretty dark days; days where I couldn't see any worth in myself, days when I dreaded looking in the mirror because I despised what I saw. There have been moments of absolute agony, but there have also been moments of self realization and triumph. It has been difficult for me to put this experience into words, but it's an experience I know I will look back on with gratitude for the chance Heavenly Father has given me to learn and grow. For those that don't know what Bell's Palsy is, it is paralysis of the facial nerve. So, one side of my face is completely paralyzed. It has caused problems with my vision, hearing, and taste and is pretty painful to be honest. So to wake up one day (my two year wedding anniversary of all days) with half of my face paralyzed, no sight in my left eye, and my hearing gone in the left ear...I was terrified. Thankfully, I was able to get to my doctor the same day and figure out what was going on. I was told that the stress of pregnancy was the cause of my Bell's Palsy (I was 38 weeks pregnant when this happened) and that it could take anywhere from 2 weeks to 1 year to heal - which isn't exactly what a 38 week pregnant lady wants to hear when she's already not feeling too great. But I was thankful to know that the outlook was good regardless. The first few days I was able to remain pretty positive and even joke about my paralyzed face, but when a week had passed by and there was still no visible progress, my attitude changed completely. I was so emotionally worn down and began to lose hope. My head was (and sometimes still is) filled with all the dark, ugly thoughts imaginable. I was so filled with fear and self hatred. I worried that my face would never heal. I worried that my husband would stop loving me. I was afraid that the first time my son saw me when he was born he would be scared of how I look. That he wouldn't see beauty or happiness but rather a stone cold face that could only move in disfigured ways..that his mom would be ugly to him. I feared I would never be able to smile again..that my son would never see me smile. I especially feared that I would never even feel like trying to smile again. I was so embarrassed and ashamed of my face. I hid my face as much as possible and my quality of life continued to go down. The day came when my son was born, and though things were slightly improving, my face still hadn't returned to normal. He was so beautiful and I wanted so desperately to see him clearly instead of through blurred vision. I refused to let anyone take pictures of me because I was so embarrassed of my face. I'm still not quite ready to share everything that happened the day Conrad was born, but when the nurse took him to the NICU and told me something was wrong with his heart, I felt I had no more strength within me at all. Anything that was holding me together at that point was shattered. This was the first time in my life that I really had the "Why Me" argument with my Heavenly Father. I was so angry that He hadn't healed my face. I was so angry that I didn't get to have the birth experience I wanted. I was so scared for my baby. I was bitter and broken. This wasn't what I had pictured for my life. 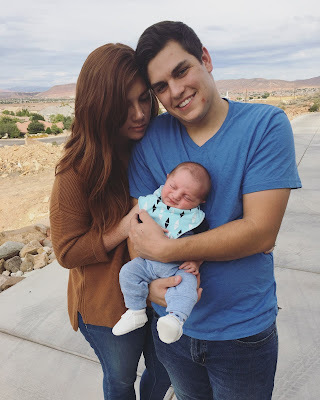 Soon enough, we were able to bring our Conrad James home and life started to calm down a bit. Gradually, I cared less about how I looked and cared more about how I acted. Instead of feeling bitterness for not looking the way I wanted, I began to appreciate my body for its ability to start functioning again. Progress is so slow but little by little, I am starting to heal. I guess what I'm really trying to say is, I took my smile for granted until I physically could not smile anymore. I never appreciated my body or my smile until I got Bell's Palsy. I never appreciated the ability to express my emotions through my face alone. I never appreciated being able to eat and drink with ease. I never appreciated my hearing or my sight. It took losing the ability to do those things for me to truly appreciate my body and what it can do. God has created us all with love and care. Appreciate your body. Appreciate your abilities. Appreciate your unique smile and attributes. While I still miss the way my face used to be and what it was like to properly smile, I am at ease with how I am in this moment. Because there's more to me than just my smile. Because there's more to life than physical appearance. Because I refuse to let Bell's Palsy ruin my life.